US 50 has the distinction of being one of the last transcontinental highways that remains intact. It is also a very historic route that has played a key role in the development of the US West. Most notably, it formed the western portion of the historic Lincoln Highway, the first true transcontinental highway route. Most people know it by its title, "The Loneliest Road in America." The State of Nevada is proud enough of this distinction to have created markers on the road to signify this fact. 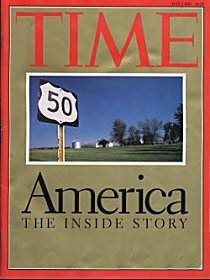 However, it is important to remember that it is only the stretch through Nevada that is lonely; as the magazine cover attests, US 50 tells the story of America. The authors of the accompanying article followed it from coast to coast and used it as a backdrop for their story. It is easy to see how US 50 has endured as one of the most interesting of the historic highways that goes through California and the United States. US 50 started in San Francisco at the intersection of Harrison and 10th Streets and went over the Bay Bridge to Oakland. From there it followed the general route of I-580, I-205, I-5 and SR-99 to Sacramento. Beyond Sacramento, US 50 has been built as freeway/expressway along new alignments, though east of Placerville it follows the same general routing through the Sierras, with the high point still being Echo Summit. Outside of California, US 50 is mostly separated from Interstates which has allowed it to retain many of its older characteristics. It crosses through the heart of the United States and offers a complete taste of all this country has to offer. A highlight is that along with US 1 it goes along both sides of the Capitol Mall in Washington, D.C. Almost all of US 50 remains outside of California save for the sections that have been rerouted along Interstate Highways. A part of US 50 east of Washington, D.C. has been designated as I-595. However, the indication is that it will remain signed as US 50; the Interstate designation was used primarily as a means of funding the freeway improvements for that section. Its eastern terminus continues to be and will remain North Division St and the Boardwalk in Ocean City, MD. Thanks to Mark Eisner for the information about the East Coast portion. US 50 is one of the few US highways to have been kept intact in California. At one point it had extended to San Francisco, but with the completion of its successor Interstate Highways in the early 1970s, its terminus was brought back to Sacramento. Interestingly its terminus in West Sacramento at I-80 is close to the original one in 1926. While many parts of the old road have been incorporated into the Interstate Highways that replaced it, there are still many sections remaining all along its route that are worthy of attention. US 99 from Stockton to Sacramento. *"US 50A" is not an actual state operated US highway nor is it an AASHTO approved route. It is included due to the novelty of it being signed exactly like a state route. The US 50 Guide will have detailed descriptions of its old routings and what remains today. Since US 50 was such an important road, there are several web pages dealing with it. 1 The cover is (c)1997 by Time Warner and all their rights are reserved.